Our stage curtain hire options use professional theatre quality black wool drapes which are ideal for stage backing for example when using our portable staging. They can also be used for masking areas from audience to provide off stage prop storage or temporary changing areas / green rooms. The stage curtains are mounted on an easy to erect ﬂoor standing frame system which is available to hire in either 4 x 3.6m or 4 x 4m sizes. 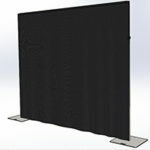 The hire shop also has available general purpose stage borders which are approximately 8.5m x 2.5m. supplied without frames, these curtains can be used for masking along stage edges or to provide masking on the stage wings.